I’ve long been an advocate of free ranging my farm critters, at least where it’s practical. (Chickens, turkeys, ducks, and alpacas, yes. Goats and pigs? Not so much, as I would hate to cause a swath of landscape devastation, at least to the neighbors I like). Every chicken I’ve ever seen that’s been housed in a tractor, and I’ve seen many, have a haunted, rumpled, caged look that breaks my heart. Ducks can make mud appear out of thin air, and when they’re penned in they look more like wallowing pigs than birds. They don’t even wander particularly far, they just like to spend the morning scouting out sunny places to nap, then spend the afternoon putting them to good use. I think the people who have visited us here at the farm will agree our critters are among the happiest of all the farm critters, in no small part because they spend their lives contentedly doing whatever nature intended them to do. 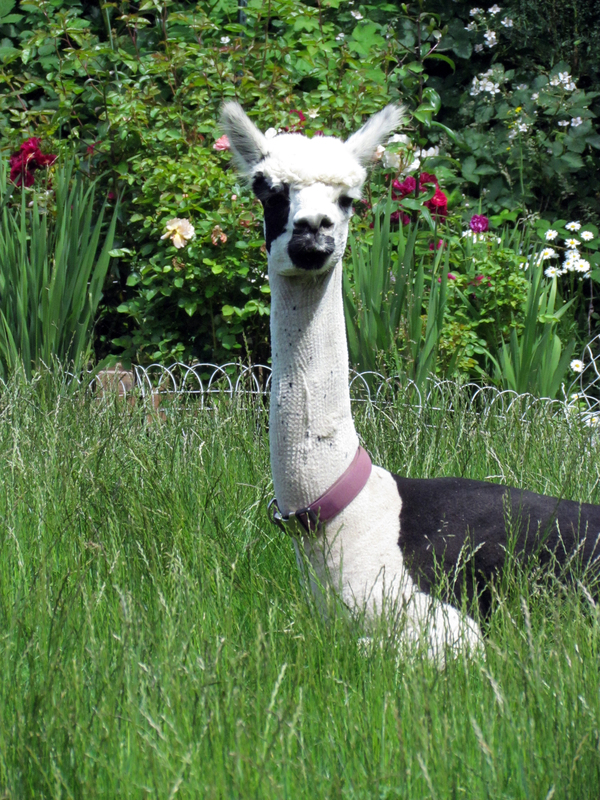 I’ve spent many a calm, reflective morning sitting on the porch with a cup of coffee watching herds of ducks hunting for delicious insects while a content alpaca keeps the grass at a decent level. However, this morning, my coffee reverie was interrupted by the sight of that same content alpaca placidly knocking all the apples off the two potted apple trees on our deck, apparently for the express purpose of then watching the chickens roll them around. Not only did it sound like a herd of elephants was outside, but apples bits were flying everywhere. 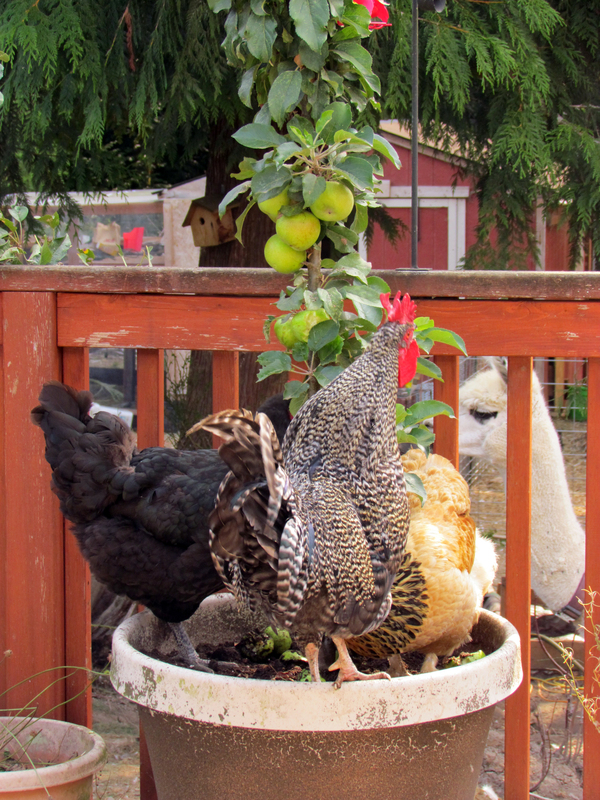 It took about two minutes before the chickens realized the source of the deliciousness, and hopped up into the pots to eat the apples straight off the tree. Although I had to smile since they were so enthusiastic about their snacks, I was a little broken hearted because I had plans for those apple trees. Pie-related plans. I had similar dreams for handcrafted coleslaws; dreams which met much the same fate. My favorite green leafy vegetable, bok choys, had to be replanted in the front gardens, because it disappeared from the back garden. 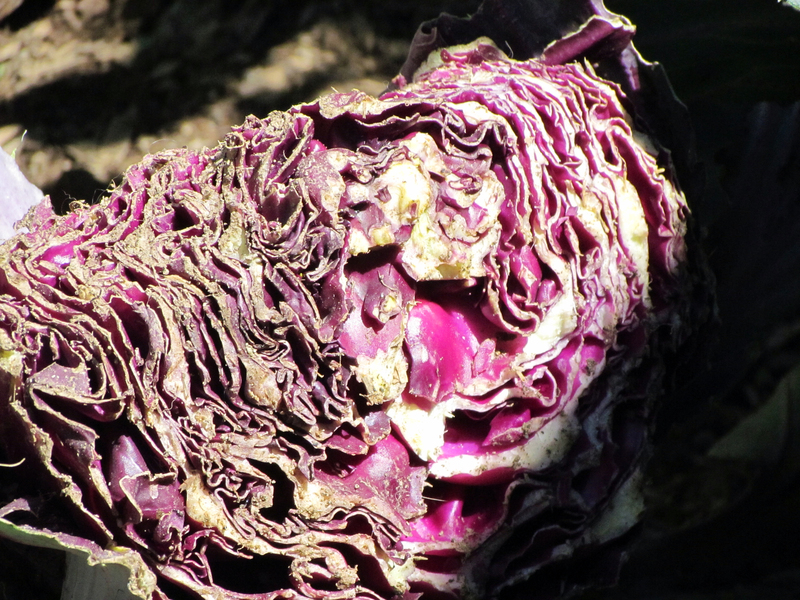 So did the swiss chards, the celery, and the kale. 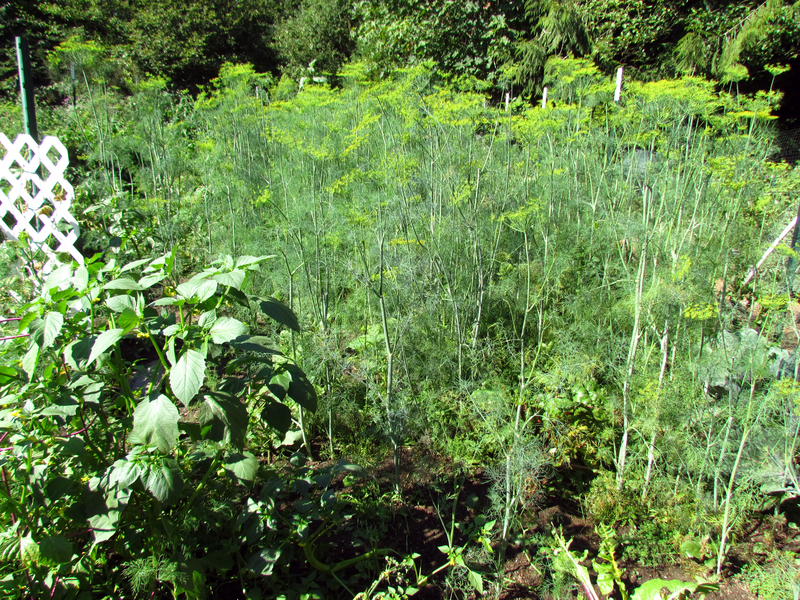 Apparently the hungry, hungry bunnies don’t like dill, because that’s about ten feet tall now, and reseeded itself to the extent that it appears I intentionally tried to grow it the same way other people grow a lawn. No matter how aggravated I get, though, or how annoyed I am at having to actually buy swiss chard at the grocery store like all the non-farmers, it’s impossible to stay mad when Harvey rampages up to me, puts his huge paws on my knee, and asks for a treat. Ever since I gave up city living for the farm lifestyle, almost five years ago now, I’ve dreamed of having a garden like the ones you see in those fancy magazines. Nary a weed in sight, obvious pathways that you can actually walk down, and color-coordinated blooming companion flowers have been my aspiration. And every year, I fall horrendously, terribly short in the planning department. Don’t get me wrong – I love my gardens. But Sunset magazine isn’t going to be snapping pictures left and right in my back yard any time soon. Despite my best effort at organization, I have a pumpkin plant literally growing out of a tomato plant, and the only reason you can get inside at all to harvest anything is because Abigail trampled a Godzilla-like network of paths in order to chase down the errant baby bunnies. I have squashes of some sort hanging from the huckleberry bushes, and I don’t even remember planting that type. I even tried matching what’s growing out there to the pictures on the seed packets, and couldn’t come up with a winner. I have found that despite having a college degree (with minors in botany and biology, no less), I can’t correctly label a plant to save my life. I spent hours upon hours carefully making little bamboo skewer and scotch tape label flags, and as soon as I deposited a seed, I stuck an ID flag in the little pot. When I transplanted the little pots, the skewer flags came with. It’s not rocket science, right? But I still ended up with obvious squash vines tagged as peppers. Sigh. And even the correct flags faded to the point where I can’t read them anyway. Double sigh. Good thing I like culinary surprises!